A straightforward action flick, Broken Arrow sets its sights on blowing things up and sticks to its agenda of expensive pyrotechnics attached to a cheap story. Major Vick Deakins (John Travolta) and Captain Riley Hale (Christian Slater) of the US Air Force are tasked with flying a B-3 Stealth Bomber equipped with two nuclear missiles on a test mission over the Utah desert. Deakins is disgruntled with his career and has secretly masterminded a plot to steal the bombs and demand a large sum for their return. Hale survives Deakins' attempt to kill him, and after the bomber crashes in the desert, the race is on to recover the nukes. Deakins has assembled a large and well equipped team of henchman to help with his plan, while Hale teams up with resourceful Park Ranger Terry Carmichael (Samantha Mathis). Meanwhile government agent Giles Prentice (Frank Whaley) is dispatched from Washington DC to assess the unfolding situation, while Colonel Max Wilkins (Delroy Lindo) tries to assemble a force to assist Hale. Directed by John Woo, Broken Arrow is a a mindless action movie unconcerned with logic, characters or any semblance of plot progression. The only objective is to destroy hardware, and Woo blows up helicopters (many helicopters), planes, trains, trucks and a copper mine at regular intervals. If there is one certainty in Broken Arrow, it is that every piece of equipment introduced on the screen will be a flaming wreck before the credits roll. In between, thousands of bullets are exchanged in chaotic firefights, as secondary characters are efficiently perforated while Deakins, Hale and Terry of course survive effectively unscathed to make it to the grand finale. John Travolta does his best to exude some elements of cool evil, but even he struggles to make a mark among all the detonations. The rest of the cast members stick to plastic mode, neither Christian Slater nor Samantha Mathis emerging with any credit. 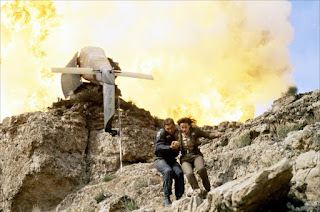 The true heroes are the stunt performers, and Broken Arrow features someone falling down a hill, off a bridge, out of a helicopter or thrown from a train at the same regularity as all those explosions. Woo knows his way around filming action scenes and the movie looks great, but that's all. The script by Graham Yost is satisfied with broad brush strokes to define a most rudimentary plot and superficial characters, and then stands back from providing any depth. The result is a loud, boisterous and quite silly game of chase the bombs in the desert.